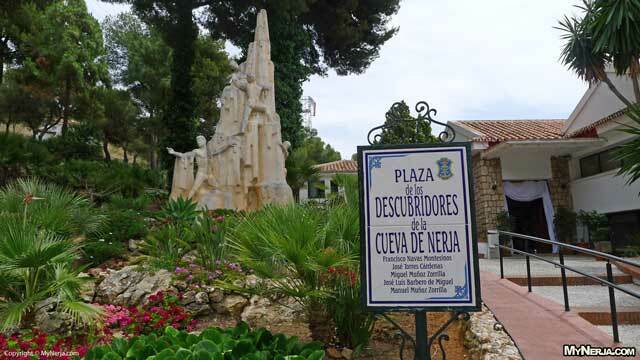 The Nerja Caves (Las Cuevas de Nerja in Spanish), are Nerja’s most famous tourist attraction, competing with the Balcon de Europa and Burriana beach for the attention of the visitors. The caves themselves are more than five million years old and were home to early mankind more than 40,000 years ago – as such the caves are also an important research site for scientific investigation. Researchers have found skeletal remains along with the oldest cave paintings in Europe, along with evidence that the cave dwellers once feasted on roast whale . The caves stretch for more than 7kms in length – although only a relatively small part is open to the public (the Show Galleries) the scientists who work at the caves also have access to the Upper Gallery and the New Gallery discovered in the 1960s. The caves were re-discovered in modern times by five young men out exploring in the countryside near to Maro in 1959, when they found the first entrance to the caves. Since then the caves have grown to be the biggest tourist attraction in this part of Spain, attracting thousands of visitors every year to see the fantastic formations of stalactites and stalagmites, and other dazzling natural rock structures. Each gallery in the Nerja Caves has been christened after these rock formations, the most spectacular of which is the Sala de Cascada or The Cascade Gallery. This gallery, which as its name suggests features waterfalls of rocks, is a natural theatre and every summer hosts the Nerja Caves Festival of music and dance. 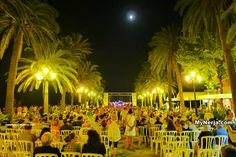 In the summer months a series of concerts are held in the caves, as part of the Nerja Caves Festival – the 54th edition of which starts on the 24th of July 2013. 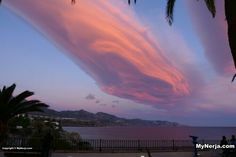 Tickets for all shows are priced at between 25 and 40 euros, and will go on sale on the Nerja Caves website in March or April. The Festival remains the most important promotional activity in the Nerja Caves, and this year has a budget of €230,000 opening with a concert by the Strasburg classical string quartet. 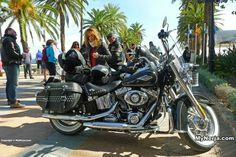 The festival is always immensely popular and if you are going to be in Nerja when the concerts are on, it is highly recommended that you try and book tickets – ask in the tourist information office in Nerja or at the caves themselves. The caves also hold occasional concerts at other times of the year, often free to ticket holders. Again these are well worth attending if you are lucky enough to be around when they are on. As already mentioned, the first humans to find the caves were not the 5 young boys from Nerja but Neanderthals, and recent investigations have confirmed that flint tools discovered in the Nerja Caves are up to 40,000 years old and were Neanderthal in origin. This discovery places the Nerja Caves as one of the last places in Europe where Neanderthals existed before becoming extinct about 30,000 years ago. After the Neanderthals the caves were inhabited from about 25,000 BC until about 2000 BC. These early residents marked their presence with cave paintings, and left further evidence behind in the form of tools, pottery and their skeletons. 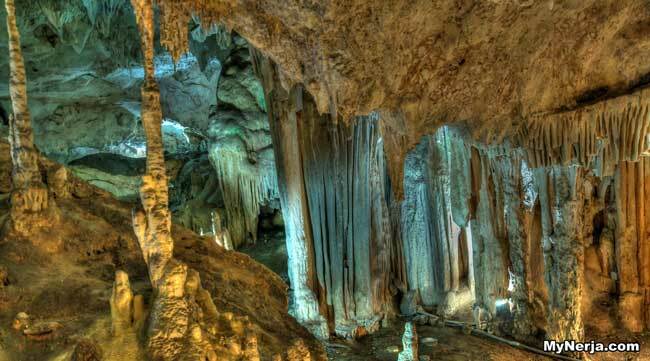 The Nerja Caves has a fascinating ongoing exhibition outlining the history of the people, the geology and the region in general. 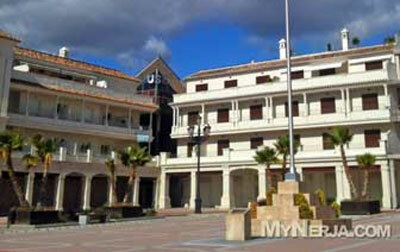 A virtual tour of the caves is available from the Nerja Caves official website (link below). 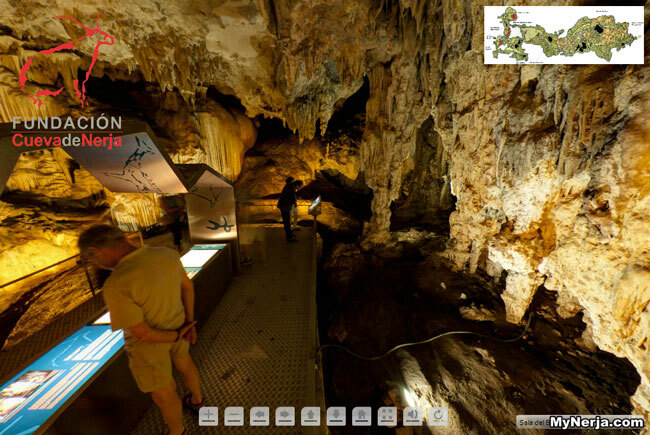 This google StreetView style tour gives you the chance to visit the caves from the comfort of your own home via a series high definition panoramic images produced by a specialist company. The images allow visitors to get an idea of what to expect in the caves, or make a virtual revisit to the caves if you have been before. The virtual tour only covers the lower galleries and teh company responsible, Wellrounded360 º are now working on the upper galleries which are closed to the public. These are the galleries where the 40,000 year old cave paintings of seals have been found. To see the virtual tour click on the Virtual Tour tab on the left on the Nerja Caves official website – www.cuevadenerja.es. The Nerja Caves Museum opened in the centre of Nerja, in Plaza España (the square behind the Tourist Office at the Balcon de Europa) in November 2011 and has a small number of exhibits from the caves on show. You can buy a combined ticket for entrance to the caves and the museum, or entrance is free on Sundays for EU citizens. In our opinion the museum experience is unfortunately not worth the entrance price, so we would only recommend visiting on days when it is free, or as part of a combined ticket. 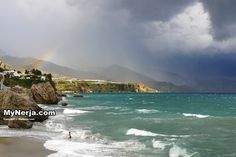 Buses run to the caves and to Maro from Nerja every day. See the timetable here. 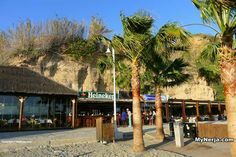 If driving there is a car park at the caves, and from Nerja you need to take the A340 out of town to the east, direction Maro. 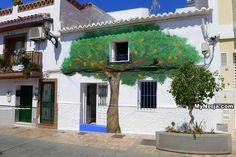 The caves are only 3 kms from Nerja so it is quite possible to walk there, but on a really hot day it might be best to consider the bus if you want to arrive fresh for the tour. The caves are open every day of the year apart from Jan 1st and May 15th, which is the Festival of San Isidro. A visit should take around 1 or 2 hours in total. There is also a reasonably priced restaurant where you can have lunch or just a coffee and there is also a picnic area and childs playground in the caves grounds.